This post is a deviation from my regular posts about my experience with surviving domestic violence, but since my writing life has been heavily influenced by that experience lately, I’ve decided to dedicate some blog space to participating in the writing process blog tour. I also recently had an essay reviewed at Essay Daily, and as a follow up to that essay, Melanie Bishop did a Q & A with me where I talked in length about what it means to write and be labeled as an abuse survivor. Thank you to Rachel May for passing this blog tour on to me. Rachel found me on Facebook after reading my essay, It Will Look Like a Sunset. Since then, I’ve enjoyed our interactions as well as her creative and scholarly work on quilting, narrative, and cultural studies. About her book, Quilting With a Modern Slant, Rachel writes: No matter how we define ourselves, quilters forge powerful communities, in which we rely on each other for friendship, feedback, and inspiration. I’m excited about that sense of community, and what we can accomplish together. I’m excited to be a new member of Rachel’s community. My most recent writing has brought me into a community of survivors, activists, artists, and writers, and I can’t say that I’ve ever had a more fulfilling experience. So thank you to everyone who stops by to read about and share my experiences with me. And with that, I’ll answer the following four questions about my writing process, then pass it on to three writers who have become part of my writing community in the past year. I’m currently working on a collection of linked essays about surviving domestic violence. I’ve already published two of these essays, I have another one forthcoming, and I’m working on a different one now. As I progress in this project, I’ve noticed the essays becoming less about the abuse and more about my own internal dialogue, how I’ve been recovering from the abuse, and how I’ve been negotiating life after divorce, and as a single mom. I have many stories to tell, and the abuse is quickly becoming only a small part of my story. I have a completed manuscript, Demolition (which I’m sitting on for now while I decide what to do with it). In that book, the essays are more quiet and nuanced. 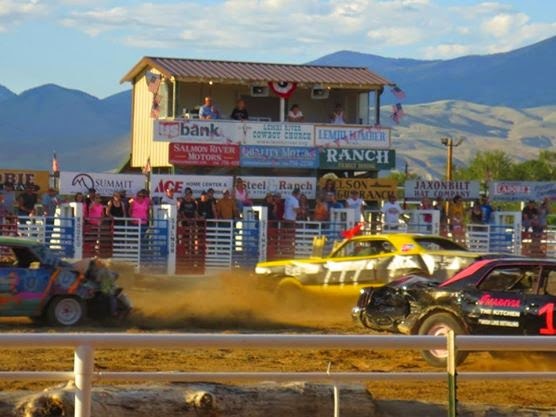 They focus on pedestrian topics like babysitting and demolition derbies, but the various threads are about interpersonal relationships and the tension between the landscape and its inhabitants. As I’ve progressed on my current manuscript, I’ve found myself returning back to these quieter themes. I’m currently working on an essay tentatively titled “Poppies” about the poppies that now grow in an abandoned yard after a neighbor’s house burned down with him inside of it, but like all of my writing, the true subject is me, how I reacted to that neighbor during an incident before he died, and how that reaction was typical of the way I responded in such situations. Domestic violence is a thread in the essay, but it’s only one of many. 2) How does your work differ from other work in its genre? I’m very interested in structure and using structure to create tension within my essays. A writer recently told me that I would be a good screenplay writer because I know just when to end a scene, and I think that is a strength of mine. When I’m writing, I often write scenes first, then piece them into a complete essay. I don’t know if I’m capable of writing a sustained full-length memoir, but my essays usually come together as a collection. With Demolition, I remember thinking, “How should I arrange these essays?” But the answer was so clear–chronologically. As a whole, they were a memoir. In a conversation with an editor recently, I had to admit that I’m an essayist at heart. I’m too attached to the short form to let that go. I love the feeling of completing an essay. I love to use maximalist language. I love to create scenes that have punch. I started out writing poetry, but I wasn’t a very good poet. Still, I hope that my initial love of poetry comes through in the lyricism of my essays. I write whatever the little spark inside of me wants to write. I get an idea. An image. A scene. And then I have to write it. I have a whole folder on my computer of ideas, and those ideas are usually based on some kind of image that I’ve seen in my daily life. I’ve lived an interesting life. I’ve seen many interesting things, but that doesn’t mean that I want to write about them. As a writer of nonfiction, people are always telling me “You should write about X.” Well, yes, I probably should, but I can’t. I write what my body wants to write. I’ll be honest and say that my writing process needs some revision. In my defense, I think this is largely because of my life circumstances. I’m a single mother in a PhD program with academic and teaching work to complete on top of my writing, so it’s not always easy. I’m also trying to nourish myself holistically, so in the summer, I work a job in the outdoors where I get a lot of sunshine and interact with many fun rafters on a wilderness river in Idaho. This job has nothing to do with writing, but as my friend pointed out to me at lunch today, I always come back to my program at the end of the summer calmer and more centered, so I’ve made the decision that my writing life actually benefits from that experience. My life is my subject so I need to live it. Pam Houston, a writer whose work I deeply admire for her ability to make connections between her inner life and the outside world, once said that she writes in “bulimic bursts” and I would say that I’m similar. Maybe that’s symptomatic of being a writer who very much values the outdoors and lived experience, but I don’t want to always be shut indoors writing. I did that during my MFA, and I was miserable, so for me, I need to have balance. During the school year, I don’t have that balance. I work very hard. I raise my child alone. I’m ambitious, driven, and disciplined, and I generally have a great deal of output. Then, during the summer, I give myself a bit of a break. I allow myself to daydream. I take five mile walks every day. I sit in the river in a camp chair with a friend while our legs bob along in the surf. Those are the times when I think about poppies. Kirk Wisland blogs at But Then I Think…. Kirk entered the PhD program at the same time as me, and we have bonded over being fellow nonfiction writers, children of Midwestern Lutherans, and as a result, maybe, slightly, overly accommodating…. I love Kirk’s work because of his honesty, wit, careful language, and thoughtfulness. Kirk is a full-time wielder of the Pen of Nonfiction, occasional short-story writer and woefully infrequent blogger. His work has appeared in The Normal School, Diagram, Creative Nonfiction, Essay Daily, Paper Darts, Phoebe, and Fiction on a Stick. he lives in Athens, Ohio, where he is pursuing is PhD in Creative Writing at Ohio University. He is an ardent Timberwolves fan and unrepentent political junkie. he wanted to surf, but feared the sharks. Chelsea Biondolillo blogs at Roaming Cowgirl. She has already completed the Writing Process Blog Tour here. I met Chelsea at when we were part of a panel on publishing flash nonfiction. In the past year, I’ve grown to enjoy her visceral writing about vultures, and the way she makes connections between the natural world, her body, and her inner state. I also enjoy her many unapologetic food pictures that she posts on Facebook. Chelsea’s prose has appeared or is forthcoming in Passages North, Guernica, Rappahannock Review, River Teeth, Shenandoah, and others. She has an MFA in creative writing and environmental studies from the University of Wyoming, and is the 2014-15 O’ Connor fellow in nonfiction at Colgate University. Rebecca Hazelwood and I met on Facebook through a writer’s group. Rebecca and I have bonded over talk of personal essays and our mutual desire to someday have our very own Danny Castellano from The Mindy Show. Rebecca’s essays are honest, disarming, sad, and poignant. Rebecca blogs about the awkward and mundane (and what she’s reading) as Wild Ruled on tumblr and she runs a poetry blog, Structure and Style with a friend. Rebecca has been published in PANK and Still: The Journal, and she’s working on a memoir via essays about her father, her family, her aunt’s gun, and what she’s afraid of. She holds an MFA from Georgia College and is just starting a PhD in English/Creative Writing at the University of Louisiana at Lafayette.